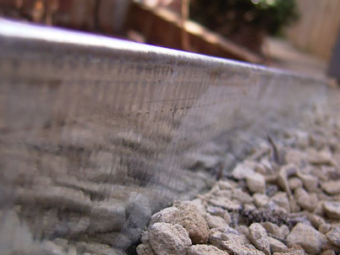 Formboss Galvanised Steel Edging is the most affordable, yet durable steel edging available. Australian made by BlueScope Steel Australia, this product has a 10-year structural guarantee, ensuring that you can be confident when installing Formboss in any application. Formboss Galvanised Steel Edging can be used to create seamless designs in practically all garden environments; whether you'd like to make a sleek garden bed, Retaining Wall or Garden Ring, we have the material for you. 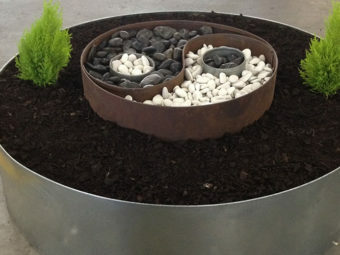 Galvanised Steel Garden Rings are our most affordable and versatile rings available. Starting with a bright shine, these rings fade over time to produce a soft grey that will seamlessly blend into any garden. Alternatively, our Galvanised Steel Garden Rings can also be painted, producing a unique feature piece that is limited only by your own imagination. 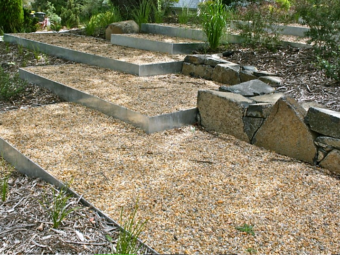 With the help of our Angled Stakes, Formboss Galvanised Steel Edging can also be used to create beautiful and durable retaining walls and steps etc. By using our 230mm, 290mm, 390mm or 580mm lengths, which boast a thicker gauge, it is easy to construct your perfect wall. 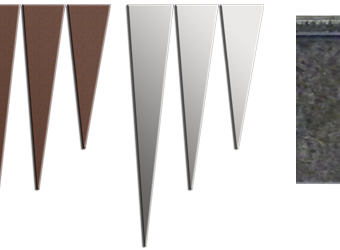 Tapered stakes are ideal for profile heights up to 150mm high. They provide a great option for strengthening and anchoring your edging, and their sleek design makes them easy to secure into the ground. The general rule of thumb when choosing the correct stake for your job is to make sure that the stake is a minimum of twice your edging profile height. For general applications we strongly recommend using 3 stakes spaced out evenly per length of edging. For best results secure one stake 400mm from each end and one in the middle of the length. REDCOR® Steel Angled Stakes have been specially designed for heavy duty applications, providing superior strength for all jobs. Their unique design allows them to be used as supports for retaining walls. 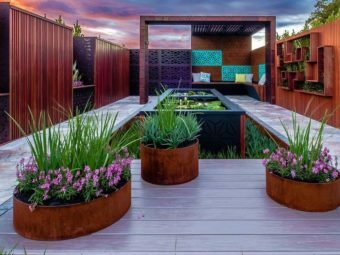 Manufactured by BlueScope Steel Australia, REDCOR® Steel Edging is an Australian Made “Corten” weathering steel that provides an organic rustic look. 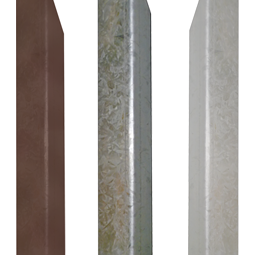 Despite its rustic look REDCOR® Steel Edging has an increased resistance to corrosion. It forms a protective layer of oxide on its surface which provides a stable rust-like appearance that regenerates as required over the life of the steel. 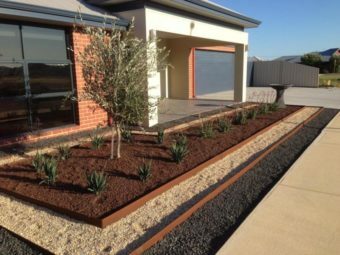 REDCOR® Steel Edging has fast become our most popular range, due to its stunning appearance, durability and wide range of applications which include vegetable & garden beds, tree surrounds and even small retaining walls. 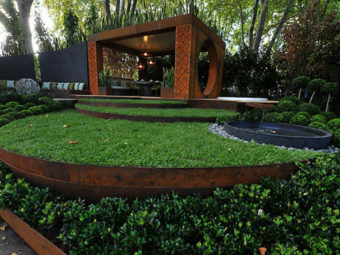 REDCOR® Steel Garden Rings offer both an affordable and unique design that will be the centrepiece of any garden. These rings provide a rustic, yet timeless look, and they have fast become our most popular Garden Rings. Although they are predominately known for being a rustic garden feature, these rings are also quickly becoming a popular option for constructing small fire pits. With the help of our Angled Stakes, Formboss REDCOR® Steel Edging can also be used to create beautiful and durable retaining walls and steps etc. By using our 230mm, 290mm, 390mm or 580mm lengths, which boast a thicker gauge, it is easy to construct your perfect wall.